Heparin is an injectable blood thinner (anticoagulant). It is used to treat and prevent deep vein thrombosis and pulmonary embolism. It is also used as part of the treatment of myocardial infarction and unstable angina. Other uses include on the inside surfaces of various devices such as test tubes and kidney dialysis machines. Common side effects include bleeding, pain at the injection site, and low blood platelets. Serious side effects include heparin induced thrombocytopenia. Greater care is needed in those with poor kidney function. Heparin appears to be safe for use during pregnancy and breastfeeding. It is a naturally occurring glycosaminoglycan. Heparin's normal role in the body is unclear. Heparin is usually stored within the secretory granules of mast cells and released only into the vasculature at sites of tissue injury. It has been proposed that, rather than anticoagulation, the main purpose of heparin is defense at such sites against invading bacteria and other foreign materials. In addition, it is observed across a number of widely different species, including some invertebrates that do not have a similar blood coagulation system. It is a highly sulfated glycosaminoglycan. It has the highest negative charge density of any known biological molecule. In nature, heparin is a polymer of varying chain size. Unfractionated heparin (UFH) as a pharmaceutical is heparin that has not been fractionated to sequester the fraction of molecules with low molecular weight. In contrast, low-molecular-weight heparin (LMWH) has undergone fractionation for the purpose of making its pharmacodynamics more predictable. Often either UFH or LMWH can be used; in some situations one or the other is preferable. Heparin is on the World Health Organization's List of Essential Medicines, the most important medications needed in a basic health system. Heparin and its low-molecular-weight derivatives (e.g., enoxaparin, dalteparin, tinzaparin) are effective at preventing deep vein thromboses and pulmonary emboli in people at risk, but no evidence indicates any one is more effective than the other in preventing mortality. A serious side-effect of heparin is heparin-induced thrombocytopenia (HIT), caused by an immunological reaction that makes platelets a target of immunological response, resulting in the degradation of platelets, which causes thrombocytopenia. This condition is usually reversed on discontinuation, and in general can be avoided with the use of synthetic heparins. Also, a benign form of thrombocytopenia is associated with early heparin use, which resolves without stopping heparin. Two non-hemorrhagic side-effects of heparin treatment are known. The first is elevation of serum aminotransferase levels, which has been reported in as many as 80% of patients receiving heparin. This abnormality is not associated with liver dysfunction, and it disappears after the drug is discontinued. The other complication is hyperkalemia, which occurs in 5 to 10% of patients receiving heparin, and is the result of heparin-induced aldosterone suppression. The hyperkalemia can appear within a few days after the onset of heparin therapy. More rarely, the side-effects alopecia and osteoporosis can occur with chronic use. As with many drugs, overdoses of heparin can be fatal. In September 2006, heparin received worldwide publicity when three prematurely born infants died after they were mistakenly given overdoses of heparin at an Indianapolis hospital. Protamine sulfate (1 mg per 100 units of heparin that had been given over the past four hours) has been given to counteract the anticoagulant effect of heparin. The conformational change in AT on heparin-binding mediates its inhibition of factor Xa. For thrombin inhibition, however, thrombin must also bind to the heparin polymer at a site proximal to the pentasaccharide. The highly negative charge density of heparin contributes to its very strong electrostatic interaction with thrombin. The formation of a ternary complex between AT, thrombin, and heparin results in the inactivation of thrombin. For this reason, heparin's activity against thrombin is size-dependent, with the ternary complex requiring at least 18 saccharide units for efficient formation. In contrast, antifactor Xa activity requires only the pentasaccharide-binding site. This size difference has led to the development of low-molecular-weight heparins (LMWHs) and, more recently, to fondaparinux as pharmaceutical anticoagulants. LMWHs and fondaparinux target antifactor Xa activity rather than antithrombin activity, with the aim of facilitating a more subtle regulation of coagulation and an improved therapeutic index. The chemical structure of fondaparinux is shown above. It is a synthetic pentasaccharide, whose chemical structure is almost identical to the AT binding pentasaccharide sequence that can be found within polymeric heparin and heparan sulfate. With LMWH and fondaparinux, the risk of osteoporosis and heparin-induced thrombocytopenia (HIT) is reduced. Monitoring of the activated partial thromboplastin time is also not required and does not reflect the anticoagulant effect, as APTT is insensitive to alterations in factor Xa. Danaparoid, a mixture of heparan sulfate, dermatan sulfate, and chondroitin sulfate can be used as an anticoagulant in patients having developed HIT. Because danaparoid does not contain heparin or heparin fragments, cross-reactivity of danaparoid with heparin-induced antibodies is reported as less than 10%. The effects of heparin are measured in the lab by the partial thromboplastin time (aPTT), one of the measures of the time it takes the blood plasma to clot. Partial thromboplastin time should not be confused with prothrombin time, or PT, which measures blood clotting time through a different pathway of the coagulation cascade. Heparin is given parenterally because it is not absorbed from the gut, due to its high negative charge and large size. It can be injected intravenously or subcutaneously (under the skin); intramuscular injections (into muscle) are avoided because of the potential for forming hematomas. Because of its short biologic half-life of about one hour, heparin must be given frequently or as a continuous infusion. Unfractionated heparin has a half-life of about one to two hours after infusion, whereas LMWH has a half-life of four to five hours. The use of LMWH has allowed once-daily dosing, thus not requiring a continuous infusion of the drug. If long-term anticoagulation is required, heparin is often used only to commence anticoagulation therapy until an oral anticoagulant e.g. warfarin takes effect. Unfractionated heparin has a half-life of about one to two hours after infusion, whereas low-molecular-weight heparin's half-life is about four times longer. Lower doses of heparin have a much shorter half-life than larger ones. Heparin binding to macrophage cells is internalized and depolymerized by the macrophages. It also rapidly binds to endothelial cells, which precludes the binding to antithrombin that results in anticoagulant action. For higher doses of heparin, endothelial cell binding will be saturated, such that clearance of heparin from the bloodstream by the kidneys will be a slower process. Native heparin is a polymer with a molecular weight ranging from 3 to 30 kDa, although the average molecular weight of most commercial heparin preparations is in the range of 12 to 15 kDa. Heparin is a member of the glycosaminoglycan family of carbohydrates (which includes the closely related molecule heparan sulfate) and consists of a variably sulfated repeating disaccharide unit. The main disaccharide units that occur in heparin are shown below. The most common disaccharide unit is composed of a 2-O-sulfated iduronic acid and 6-O-sulfated, N-sulfated glucosamine, IdoA(2S)-GlcNS(6S). For example, this makes up 85% of heparins from beef lung and about 75% of those from porcine intestinal mucosa. Not shown below are the rare disaccharides containing a 3-O-sulfated glucosamine (GlcNS(3S,6S)) or a free amine group (GlcNH3+). Under physiological conditions, the ester and amide sulfate groups are deprotonated and attract positively charged counterions to form a heparin salt. Heparin is usually administered in this form as an anticoagulant. One unit of heparin (the "Howell unit") is an amount approximately equivalent to 0.002 mg of pure heparin, which is the quantity required to keep 1 ml of cat's blood fluid for 24 hours at 0 °C. The three-dimensional structure of heparin is complicated because iduronic acid may be present in either of two low-energy conformations when internally positioned within an oligosaccharide. The conformational equilibrium is influenced by sulfation state of adjacent glucosamine sugars. Nevertheless, the solution structure of a heparin dodecasaccharide composed solely of six GlcNS(6S)-IdoA(2S) repeat units has been determined using a combination of NMR spectroscopy and molecular modeling techniques. Two models were constructed, one in which all IdoA(2S) were in the 2S0 conformation (A and B below), and one in which they are in the 1C4 conformation (C and D below). However, no evidence suggests that changes between these conformations occur in a concerted fashion. These models correspond to the protein data bank code 1HPN. In these models, heparin adopts a helical conformation, the rotation of which places clusters of sulfate groups at regular intervals of about 17 angstroms (1.7 nm) on either side of the helical axis. Either chemical or enzymatic depolymerisation techniques or a combination of the two underlie the vast majority of analyses carried out on the structure and function of heparin and heparan sulfate (HS). The enzymes traditionally used to digest heparin or HS are naturally produced by the soil bacterium Pedobacter heparinus (formerly named Flavobacterium heparinum). This bacterium is capable of using either heparin or HS as its sole carbon and nitrogen source. To do so, it produces a range of enzymes such as lyases, glucuronidases, sulfoesterases, and sulfamidases. The lyases have mainly been used in heparin/HS studies. The bacterium produces three lyases, heparinases I (EC 4.2.2.7), II (no EC number assigned) and III (EC 4.2.2.8) and each has distinct substrate specificities as detailed below. The lyases cleave heparin/HS by a beta elimination mechanism. This action generates an unsaturated double bond between C4 and C5 of the uronate residue. The C4-C5 unsaturated uronate is termed ΔUA or UA. It is a sensitive UV chromophore (max absorption at 232 nm) and allows the rate of an enzyme digest to be followed, as well as providing a convenient method for detecting the fragments produced by enzyme digestion. Nitrous acid can be used to chemically depolymerise heparin/HS. Nitrous acid can be used at pH 1.5 or at a higher pH of 4. Under both conditions, nitrous acid effects deaminative cleavage of the chain. At both 'high' (4) and 'low' (1.5) pH, deaminative cleavage occurs between GlcNS-GlcA and GlcNS-IdoA, albeit at a slower rate at the higher pH. The deamination reaction, and therefore chain cleavage, is regardless of O-sulfation carried by either monosaccharide unit. At low pH, deaminative cleavage results in the release of inorganic SO4, and the conversion of GlcNS into anhydromannose (aMan). Low-pH nitrous acid treatment is an excellent method to distinguish N-sulfated polysaccharides such as heparin and HS from non N-sulfated polysacchrides such as chondroitin sulfate and dermatan sulfate, chondroitin sulfate and dermatan sulfate not being susceptible to nitrous acid cleavage. Current clinical laboratory assays for heparin rely on an indirect measurement of the effect of the drug, rather than on a direct measure of its chemical presence. These include activated partial thromboplastin time (APTT) and antifactor Xa activity. The specimen of choice is usually fresh, nonhemolyzed plasma from blood that has been anticoagulated with citrate, fluoride, or oxalate. 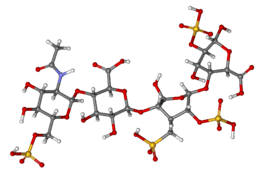 Pharmaceutical-grade heparin is derived from mucosal tissues of slaughtered meat animals such as porcine (pig) intestines or bovine (cattle) lungs. Advances to produce heparin synthetically have been made in 2003 and 2008. In 2011, a chemoenzymatic process of synthesizing low molecular weight heparins from simple disaccharides was reported. Heparin was discovered by Jay McLean and William Henry Howell in 1916, although it did not enter clinical trials until 1935. It was originally isolated from canine liver cells, hence its name (hepar or "ήπαρ" is Greek for "liver"; hepar + -in). McLean was a second-year medical student at Johns Hopkins University, and was working under the guidance of Howell investigating pro-coagulant preparations, when he isolated a fat-soluble phosphatide anticoagulant in canine liver tissue. In 1918, Howell coined the term 'heparin' for this type of fat-soluble anticoagulant. In the early 1920s, Howell isolated a water-soluble polysaccharide anticoagulant, which he also termed 'heparin', although it was different from the previously discovered phosphatide preparations. McLean's work as a surgeon probably changed the focus of the Howell group to look for anticoagulants, which eventually led to the polysaccharide discovery. In the 1930s, several researchers were investigating heparin. Erik Jorpes at Karolinska Institutet published his research on the structure of heparin in 1935, which made it possible for the Swedish company Vitrum AB to launch the first heparin product for intravenous use in 1936. Between 1933 and 1936, Connaught Medical Research Laboratories, then a part of the University of Toronto, perfected a technique for producing safe, nontoxic heparin that could be administered to patients, in a saline solution. The first human trials of heparin began in May 1935, and, by 1937, it was clear that Connaught's heparin was a safe, easily available, and effective as a blood anticoagulant. Prior to 1933, heparin was available in small amounts, was extremely expensive and toxic, and, as a consequence, of no medical value. As detailed in the table below, the potential is great for the development of heparin-like structures as drugs to treat a wide range of diseases, in addition to their current use as anticoagulants. As a result of heparin's effect on such a wide variety of disease states, a number of drugs are indeed in development whose molecular structures are identical or similar to those found within parts of the polymeric heparin chain. The biological activity of heparin within species 6–11 is unclear and further supports the idea that the main physiological role of heparin is not anticoagulation. These species do not possess any blood coagulation system similar to that present within the species listed 1–5. The above list also demonstrates how heparin has been highly evolutionarily conserved, with molecules of a similar structure being produced by a broad range of organisms belonging to many different phyla. Heparin gel (topical) may sometimes be used to treat sports injuries. The diprotonated form of histamine binds site-specifically to heparin. The release of histamine from mast cells at a site of tissue injury contributes to an inflammatory response. The rationale behind the use of such topical gels may be to block the activity of released histamine, and so help to reduce inflammation. Heparin gains the capacity to initiate angiogenesis when its copper salt is formed. Copper-free molecules are not angiogenic. In contrast heparin may inhibit angiogenesis when it is administered in the presence of corticosteroids. This anti-angiogenic effect is independent of heparin's anticoagulant activity. Test tubes, Vacutainers, and capillary tubes that use the lithium salt of heparin (lithium heparin) as an anticoagulant are usually marked with green stickers and green tops. Heparin has the advantage over EDTA of not affecting levels of most ions. However, the levels of ionized calcium may be decreased if the concentration of heparin in the blood specimen is too high. Heparin can interfere with some immunoassays, however. As lithium heparin is usually used, a person's lithium levels cannot be obtained from these tubes; for this purpose, royal-blue-topped Vacutainers containing sodium heparin are used. Heparin-coated blood oxygenators are available for use in heart-lung machines. Among other things, these specialized oxygenators are thought to improve overall biocompatibility and host homeostasis by providing characteristics similar to those of native endothelium. The DNA binding sites on RNA polymerase can be occupied by heparin, preventing the polymerase from binding to promoter DNA. This property is exploited in a range of molecular biological assays. Common diagnostic procedures require PCR amplification of a patient's DNA, which is easily extracted from white blood cells treated with heparin. This poses a potential problem, since heparin may be extracted along with the DNA, and it has been found to interfere with the PCR reaction at levels as low as 0.002 U in a 50 μL reaction mixture. Immobilized heparin can be used as an affinity ligand in protein purification. The format of immobilized heparin can vary widely from coated plastic surfaces for diagnostic purposes to chromatography resin. Most types of immobilized heparin can be used in three ways. The first is to use heparin to select out specific coagulation factors or other types of heparin-binding proteins from a complex mixture of nonheparin-binding proteins. Specific proteins can then be selectively dissociated from heparin with the use of differing salt concentrations or by use of a salt gradient. The second use is to use heparin as a high-capacity cation exchanger. This use takes advantage of heparin's high number of anionic sulfate groups. These groups will capture molecules or proteins with an overall positive charge, i.e., play no role in coagulation and do not bind nucleotides. The third use for immobilized heparin is group-specific purification of RNA- and DNA-binding proteins such as transcription factors and/or virus-coat proteins. This methodology takes advantage of heparin's structural similarity to RNA and DNA, being a negatively charged, sugar-containing macromolecule. Heparin does not break up fibrin; it only prevents conversion of fibrinogen to fibrin. Only thrombolytics can break up a clot. Considering the animal source of pharmaceutical heparin, the numbers of potential impurities are relatively large compared with a wholly synthetic therapeutic agent. The range of possible biological contaminants includes viruses, bacterial endotoxins, transmissible spongiform encephalopathy (TSE) agents, lipids, proteins, and DNA. During the preparation of pharmaceutical-grade heparin from animal tissues, impurities such as solvents, heavy metals, and extraneous cations can be introduced. However, the methods employed to minimize the occurrence and to identify and/or eliminate these contaminants are well established and listed in guidelines and pharmacopoeias. The major challenge in the analysis of heparin impurities is the detection and identification of structurally related impurities. 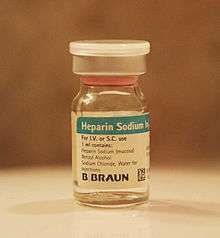 The most prevalent impurity in heparin is dermatan sulfate (DS), also known as chondroitin sulfate B. The building-block of DS is a disaccharide composed of 1,3-linked N-acetyl galactosamine (GalN) and a uronic acid residue, connected via 1,4 linkages to form the polymer. DS is composed of three possible uronic acid (GlcA, IdoA or IdoA2S) and four possible hexosamine (GalNAc, Gal- NAc4S, GalNAc6S, or GalNAc4S6S) building-blocks. The presence of iduronic acid in DS distinguishes it from chrondroitin sulfate A and C and likens it to heparin and HS. DS has a lower negative charge density overall compared to heparin. A common natural contaminant, DS is present at levels of 1–7% in heparin API, but has no proven biological activity that influences the anticoagulation effect of heparin. In December 2007, the US Food and Drug Administration (FDA) recalled a shipment of heparin because of bacterial growth (Serratia marcescens) in several unopened syringes of this product. S. marcescens can lead to life-threatening injuries and/or death. In March 2008, major recalls of heparin were announced by the FDA due to contamination of the raw heparin stock imported from China. According to the FDA, the adulterated heparin killed 81 people in the United States. The adulterant was identified as an "over-sulphated" derivative of chondroitin sulfate, a popular shellfish-derived supplement often used for arthritis, which was intended to substitute for actual heparin in potency tests. In March 2008, major recalls of heparin were announced by pharmaceutical companies due to a suspected and unknown contamination of the raw heparin stock imported from China. The contaminant was later found to be a compound called oversulfated chondroitin sulfate. The US Food and Drug Administration was quoted as stating at least 19 deaths were believed linked to a raw heparin ingredient imported from the People's Republic of China, and they had also received 785 reports of serious injuries associated with the drug’s use. According to the New York Times: 'Problems with heparin reported to the agency include difficulty breathing, nausea, vomiting, excessive sweating and rapidly falling blood pressure that in some cases led to life-threatening shock'. In 2006, Petr Zelenka, a nurse in the Czech Republic, deliberately administered large doses to patients, killing seven, and attempting to kill 10 others. In 2007, a nurse at Cedars-Sinai Medical Center mistakenly gave the 12-day-old twins of actor Dennis Quaid a dose of heparin that was 1,000 times the recommended dose for infants. The overdose allegedly arose because the labeling and design of the adult and infant versions of the product were similar. The Quaid family subsequently sued the manufacturer, Baxter Healthcare Corp., and settled with the hospital for $750,000. Prior to the Quaid accident, six newborn babies at Methodist Hospital in Indianapolis, Indiana, were given an overdose. Three of the babies died after the mistake. In July 2008, another set of twins born at Christus Spohn Hospital South, in Corpus Christi, Texas, died after an accidentally administered overdose of the drug. The overdose was due to a mixing error at the hospital pharmacy and was unrelated to the product's packaging or labeling. As of July 2008, the exact cause of the twins' death was under investigation. In March 2010, a two-year-old transplant patient from Texas was given a lethal dose of heparin at the University of Nebraska Medical Center. The exact circumstances surrounding her death are still under investigation. ↑ heparin. In: Lexi-Drugs Online [database on the Internet]. Hudson (OH): Lexi-Comp, Inc.; 2007 [cited 2/10/12]. Available from: http://online.lexi.com. subscription required to view. ↑ "Heparin Pregnancy and Breastfeeding Warnings". drugs.com. Retrieved 15 January 2016. ↑ Nader, H.B. ; Chavante, S.F. ; Dos-Santos, E.A. ; Oliveira, F.W. ; De-Paiva, J.F. ; Jerônimo, S.M.B. ; Medeiros, G.F.; De-Abreu, L.R.D. ; et al. (1999). "Heparan sulfates and heparins: similar compounds performing the same functions in vertebrates and invertebrates?". Braz. J. Med. Biol. Res. 32 (5): 529–538. doi:10.1590/S0100-879X1999000500005. PMID 10412563. 1 2 Cox, M.; Nelson D. (2004). Lehninger, Principles of Biochemistry. Freeman. p. 254. ISBN 0-7167-4339-6. ↑ Hetzel, GR; et al. (2005), "The heparins: all a nephrologist should know", Nephrol Dial Transplant, 20 (10): 2036–2042, doi:10.1093/ndt/gfi004, PMID 16030035. ↑ Guyton, A. C.; Hall, J. E. (2006). Textbook of Medical Physiology. Elsevier Saunders. p. 464. ISBN 0-7216-0240-1. ↑ Agnelli G, Piovella F, Buoncristiani P, et al. (1998). "Enoxaparin plus compression stockings compared with compression stockings alone in the prevention of venous thromboembolism after elective neurosurgery". N Engl J Med. 339 (2): 80–5. doi:10.1056/NEJM199807093390204. PMID 9654538. ↑ Bergqvist D, Agnelli G, Cohen AT, et al. (2002). "Duration of prophylaxis against venous thromboembolism with enoxaparin after surgery for cancer". N Engl J Med. 346 (13): 975–980. doi:10.1056/NEJMoa012385. PMID 11919306. ↑ Kusmer, Ken (20 September 2006). "3rd Ind. preemie infant dies of overdose". Fox News (Associated Press). Retrieved 2007-01-08. ↑ Chuang YJ, Swanson R., et al. (2001). "Heparin enhances the specificity of antithrombin for thrombin and factor Xa independent of the reactive center loop sequence. Evidence for an exosite determinant of factor Xa specificity in heparin-activated antithrombin". J. Biol. Chem. 276 (18): 14961–14971. doi:10.1074/jbc.M011550200. PMID 11278930. ↑ Bjork I, Lindahl U.; Lindahl (1982). "Mechanism of the anticoagulant action of heparin". Mol. Cell. Biochem. 48 (3): 161–182. doi:10.1007/BF00421226. PMID 6757715. ↑ Herbert, Jean-Marc; Petitou, Maurice; Hérault, Jean-Pascal; Bernat, André; et al. (1999). "Synthesis of Thrombin inhibiting Heparin mimetics without side effects". Nature. 398 (6726): 417–422. doi:10.1038/18877. ISSN 0028-0836. PMID 10201371. ↑ Shalansky, Karen. DANAPAROID (Orgaran) for Heparin-Induced Thrombocytopenia. Vancouver Hospital & Health Sciences Centre, February 1998 Drug & Therapeutics Newsletter. Retrieved on 8 January 2007. 1 2 Eikelboom JW, Hankey GJ; Hankey (2002). "Low molecular weight heparins and heparinoids". The Medical Journal of Australia. 177 (7): 379–383. PMID 12358583. ↑ Weitz JI (2004). "New anticoagulants for treatment of venous thromboembolism". Circulation. 110 (9 Suppl 1): I19–26. doi:10.1161/01.CIR.0000140901.04538.ae. PMID 15339877. ↑ Hirsh J, Raschke R; Raschke (2004). "Heparin and low-molecular-weight heparin: the Seventh ACCP Conference on Antithrombotic and Thrombolytic Therapy". Chest. 126 (3 Suppl): 188S–203S. doi:10.1378/chest.126.3_suppl.188S. PMID 15383472. ↑ Weitz DS, Weitz JI; Weitz (2010). "Update on heparin: what do we need to know?". Journal of Thrombosis and Thrombolysis. 29 (2): 199–207. doi:10.1007/s11239-009-0411-6. PMID 19882363. ↑ Francis CW, Kaplan KL (2006). "Chapter 21. Principles of Antithrombotic Therapy". In Lichtman MA, Beutler E, Kipps TJ, et al. Williams Hematology (7th ed.). ISBN 978-0-07-143591-8. ↑ Bentolila, A.; et al. "Synthesis and heparin-like biological activity of amino acid-based polymers". Wiley InterScience. Retrieved 2008-03-10. (subscription required (help)). ↑ Gatti, G.; Casu, B.; Hamer, G. K.; Perlin, A. S. (1979). "Studies on the Conformation of Heparin by1H and13C NMR Spectroscopy". Macromolecules. 12 (5): 1001–1007. doi:10.1021/ma60071a044. ISSN 0024-9297. ↑ "Online Medical Dictionary". Centre for Cancer Education. 2000. Retrieved 2008-07-11. ↑ Ferro D, Provasoli A, et al. (1990). "Conformer populations of L-iduronic acid residues in glycosaminoglycan sequences". Carbohydr. Res. 195 (2): 157–167. doi:10.1016/0008-6215(90)84164-P. PMID 2331699. ↑ Shaya D, Tocilj A., et al. (2006). "Crystal structure of heparinase II from Pedobacter heparinus and its complex with a disaccharide product". J. Biol. Chem. 281 (22): 15525–15535. doi:10.1074/jbc.M512055200. PMID 16565082. ↑ Galliher PM, Cooney CL., et al. (1981). "Heparinase production by Flavobacterium heparinum". Appl. Environ. Microbiol. 41 (2): 360–365. PMC 243699 . PMID 7235692. ↑ Linhardt RJ, Turnbull JE., et al. (1990). "Examination of the substrate specificity of heparin and heparan sulfate lyases". Biochemistry. 29 (10): 2611–2617. doi:10.1021/bi00462a026. PMID 2334685. ↑ Desai UR; Wang HM. ; Linhardt RJ. (1993). "Specificity studies on the heparin lyases from Flavobacterium heparinum". Biochemistry. 32 (32): 8140–8145. doi:10.1021/bi00083a012. PMID 8347612. ↑ Linker A, Hovingh P.; Hovingh (1972). "Isolation and characterization of oligosaccharides obtained from heparin by the action of heparinase". Biochemistry. 11 (4): 563–568. doi:10.1021/bi00754a013. PMID 5062409. ↑ Linhardt RJ, Rice KG., et al. (1988). "Mapping and quantification of the major oligosaccharide components of heparin". Biochem. J. 254 (3): 781–787. PMC 1135151 . PMID 3196292. ↑ Shively JE, Conrad HE. ; Conrad (1976). "Formation of anhydrosugars in the chemical depolymerization of heparin". Biochemistry. 15 (18): 3932–3942. doi:10.1021/bi00663a005. PMID 9127. ↑ Hansen R, Koster A, Kukucka M, Mertzlufft F, Kuppe H (2000). "A quick anti-Xa-activity-based whole blood coagulation assay for monitoring unfractionated heparin during cardiopulmonary bypass: a pilot investigation". Anesth. Analg. 91 (3): 533–8. doi:10.1213/00000539-200009000-00006. PMID 10960371. ↑ R. Baselt, Disposition of Toxic Drugs and Chemicals in Man, 8th edition, Biomedical Publications, Foster City, CA, 2008, pp. 728-729. ↑ Linhardt RJ, Gunay NS. ; Gunay (1999). "Production and Chemical Processing of Low Molecular Weight Heparins". Sem. Thromb. Hem. 3: 5–16. PMID 10549711. ↑ Bhattacharya, Ananyo (August 2008). "Flask synthesis promises untainted heparin". Chemistry World. Royal Society of Chemistry. Retrieved 6 February 2011. ↑ Xu, Y.; Masuko, S.; Takieddin, M.; Xu, H.; Liu, R.; Jing, J.; Mousa, S. A.; Linhardt, R. J.; Liu, J. (2011). "Chemoenzymatic Synthesis of Homogeneous Ultralow Molecular Weight Heparins". Science. 334 (6055): 498–501. doi:10.1126/science.1207478. PMC 3425363 . PMID 22034431. ↑ "Heparin used as an anticoagulant". AnimalResearch.info. ↑ MCLEAN, J. (1 January 1959). "The Discovery of Heparin". Circulation. 19 (1): 75–78. doi:10.1161/01.CIR.19.1.75. PMID 13619023. ↑ Howell, W H. (1922). "Heparin, an anticoagulant.". Am J Physiol. 63: 434–435. ↑ Jorpes E (August 1935). "The chemistry of heparin". The Biochemical Journal. 29 (8): 1817–30. PMC 1266692 . PMID 16745848. ↑ Rutty, CJ. "Miracle Blood Lubricant: Connaught and the Story of Heparin, 1928–1937". Health Heritage Research Services. Archived from the original on August 23, 2007. Retrieved 2007-05-21. 1 2 Lever R.; Page C.P. (2002). "Novel drug opportunities for heparin". Nature Reviews Drug Discovery. 1 (2): 140–148. doi:10.1038/nrd724. PMID 12120095. ↑ Coombe D.R. ; Kett W.C. (2005). "Heparan sulfate-protein interactions: therapeutic potential through structure-function insights". Cell. Mol. Life Sci. 62 (4): 410–424. doi:10.1007/s00018-004-4293-7. PMID 15719168. ↑ Warda M, Mao W., et al. (2003). "Turkey intestine as a commercial source of heparin? Comparative structural studies of intestinal avian and mammalian glycosaminoglycans". Comp. Biochem. Physiol. B Biochem. Mol. Biol. 134 (1): 189–197. doi:10.1016/S1096-4959(02)00250-6. PMID 12524047. ↑ Warda M, Gouda EM., et al. (2003). "Isolation and characterization of raw heparin from dromedary intestine: evaluation of a new source of pharmaceutical heparin". Comp. Biochem. Physiol. C Toxicol. Pharmacol. 136 (4): 357–365. doi:10.1016/j.cca.2003.10.009. PMID 15012907. ↑ Bland CE, Ginsburg H., et al. (1982). "Mouse heparin proteoglycan. Synthesis by mast cell-fibroblast monolayers during lymphocyte-dependent mast cell proliferation". J. Biol. Chem. 257 (15): 8661–8666. PMID 6807978. ↑ Linhardt RJ, Ampofo SA., et al. (1992). "Isolation and characterization of human heparin". Biochemistry. 31 (49): 12441–12445. doi:10.1021/bi00164a020. PMID 1463730. ↑ Hovingh P, Linker A.; Linker (1982). "An unusual heparan sulfate isolated from lobsters (Homarus americanus)". J. Biol. Chem. 257 (16): 9840–9844. PMID 6213614. ↑ Hovingh P, Linker A.; Linker (1993). "Glycosaminoglycans in Anodonta californiensis, a freshwater mussel". Biol. Bull. 185 (2): 263–276. doi:10.2307/1542006. JSTOR 1542006. ↑ Pejler G, Danielsson A., et al. (1987). "Structure and antithrombin-binding properties of heparin isolated from the clams Anomalocardia brasiliana and Tivela mactroides". J. Biol. Chem. 262 (24): 11413–11421. PMID 3624220. ↑ Dietrich CP, Paiva JF., et al. (1999). "Structural features and anticoagulant activities of a novel natural low-molecular-weight heparin from the shrimp Penaeus brasiliensis". Biochim. Biophys. Acta. 1428 (2–3): 273–283. doi:10.1016/S0304-4165(99)00087-2. PMID 10434045. 1 2 Medeiros GF, Mendes, A., et al. (2000). "Distribution of sulfated glycosaminoglycans in the animal kingdom: widespread occurrence of heparin-like compounds in invertebrates". Biochim. Biophys. Acta. 1475 (3): 287–294. doi:10.1016/S0304-4165(00)00079-9. PMID 10913828. ↑ Folkman J. (1985). "Regulation of angiogenesis: a new function of heparin". Biochem. Pharmacol. 34 (7): 905–909. doi:10.1016/0006-2952(85)90588-X. PMID 2580535. ↑ Folkman J.; Ingber DE. (1987). "Angiostatic steroids. Method of discovery and mechanism of action". Ann. Surg. 206 (3): 374–383. doi:10.1097/00000658-198709000-00016. PMC 1493178 . PMID 2443088. ↑ Higgins, C. (October 2007). "The use of heparin in preparing samples for blood-gas analysis" (PDF). Medical Laboratory Observer. ↑ FDA informational page with information and links about FDA investigation. ↑ Zawisza, Julie (29 March 2008). "FDA Media Briefing on Heparin" (PDF). U.S. Food and Drug Administration. Retrieved 2008-04-23. ↑ Blossom, DB; Kallen, AJ; Patel, PR; Elward, A; Robinson, L; Gao, G; Langer, R; Perkins, KM; et al. (2008). "Outbreak of adverse reactions associated with contaminated heparin". N Engl J Med. 359 (25): 2674–84. doi:10.1056/NEJMoa0806450. PMID 19052120. ↑ "Officials Investigate Infants' Heparin OD at Texas Hospital." ABC News. July 11, 2008. Retrieved on July 24, 2008. ↑ "Heparin Overdose Kills Toddler At Hospital, Staff Investigated." "KETV Omaha." March 31, 2010. Marcum JA (January 2000). "The origin of the dispute over the discovery of heparin". Journal of the History of Medicine and Allied Sciences. 55 (1): 37–66. doi:10.1093/jhmas/55.1.37. PMID 10734720. Mulloy B, Hogwood J, Gray E, Lever R, Page CP (January 2016). "Pharmacology of Heparin and Related Drugs". Pharmacological Reviews. 68: 76–141. doi:10.1124/pr.115.011247. Wikimedia Commons has media related to Heparin.